The Unprimed Basswood panel is handcrafted using a non-flexible basswood top, sanded perfectly smooth and ready to seal and prime with the ground of your choice. Compared with other wood panels on the market, the Unprimed Basswood is sanded perfectly smooth and lacks plywood seams, knots or raised fibers providing the cleaner, more professional look artists’ want. The support frames are made with quality solid pine strips that can be finished with paint or stain. Unprimed Basswood is great for encaustic, mixed media, collage and wood engraving. 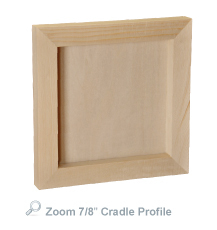 Available in two standard cradled profiles, 7/8” and 1.5”, both are simple to hang or frame. Ultra-stable, these wood panels will not give, bend or flex and like all Ampersand’s panels, they are made with quality materials that have been tested not only for durability, but also for performance with artists’ paints. 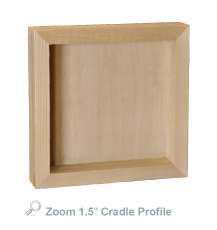 For ideas on how to treat the edges of the cradle,consult this article on hanging and framing. Superb durability! 4mm premium basswood plywood surface. No knots! Knots in wood can loosen over time and fall out, leaving a hole in your artwork. No seams! Seams where two pieces of wood meet can move independently and cause cracking and splitting in the finished artwork. No fiber raising! Easy to seal and prime to a smooth finish. Always seal and then prime wood before painting.